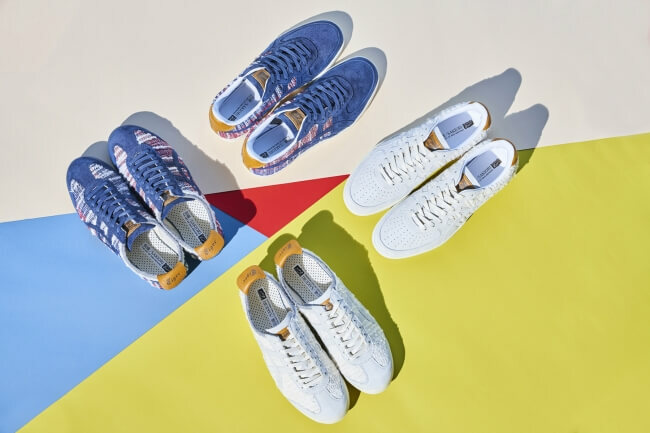 ASICS Japan’s shoe brand Onitsuka Tiger has released two new pairs of shoes in collaboration with Sansa Sakiori who are based in the city of Morioka in Iwate Prefecture. The new releases are available at Onitsuka Tiger company stores throughout Japan as well as on their online shop. Sakiori is a traditional method of weaving that has made it across the Tohoku region since the Edo Period. The material used is usually made from recycled garments and bits of kimono that are neatly woven together. Because the manufacturing is usually done by hand it can be hard to replicate with machines, meaning no two products are exactly the same, giving them their own unique charm. Two types of shoes were produced using this method: Onitsuka Tiger’s popular MEXICO 66 model and the GSM ‘coat type’ shoes. Scraps of denim are received for free from the marker during the weaving process which is used as a weft by the weavers in Tohoku to create the upper. Both are available in simple white or Onitsuka’s iconic tricolour with blue as the base. Look stylish with these new shoes that combine traditional methods with the modern Onitsuka Tiger – a true example of a product found only in Japan.